Princess Arcàdia is about to turn 15 years old and inherit the throne of Rocària. But first, her father, King Roc the Terrible, asks the hidden forces of the oracle to determine, by means of a ritual, whether the princess is worthy of being queen. Behind this ritual hides Roc’s suspicion that his daughter plans to betray him, just as he had betrayed his father, King Arisbald. Àrcadia finds out her father’s plans and, disguised as a man, flees into the mountains and hides among the forest dwellers, those inhabitants of Rocària who eke out a meager subsistence in the woods while planning their rebellion against the king. 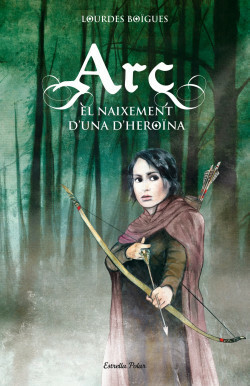 Tars, an attractive young man who lives in the forest, ends up discovering Arcàdia’s secret and they, along with the forest dwellers, leap into action and rise up against the king to allow Arcàdia to ascend to the throne. An action-packed adventure novel in the most classic style, set in the Middle Ages amid secret passageways of royal palaces and the woods where a popular rebellion is being hatched.